Radiation Armor Parts from "Terminus"
This screen used prop was seen in episodes three and four of the Doctor Who Story "Terminus" staring Peter Davison as the Doctor, Sarah Sutton as Nyssa, Janet Fielding as Tegan and Mark Strickson as Turlough. This 20th season four part serial (6g) was first transmitted on 2/15/83. Olvir (Dominic Guard) avoids the Vanir guards by ducking into a store room where he finds a rack of radiation armor parts. He decides to disguise himself as a guard using the armor. 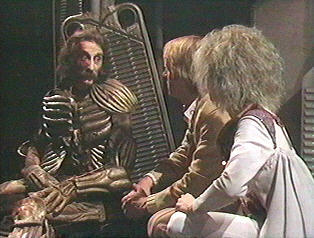 Bor (Peter Benson) can be seen in several scenes with the Doctor and Kari (Liza Goddard) using a like assemblage of parts as armor for his left arm. 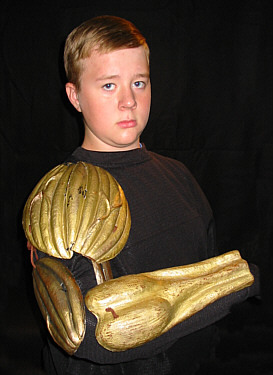 This arm assembly is one of the many pieces of armor hanging from the rack in the store room. It can be seen dangling from the wire tree in several shots. Made of fiberglass, painted with a undercoat of rust, a topcoat of gold and lashed together with heavy lacing. The lower arm piece is the underside of the protective set with the matching top half getting most of the screen time. Olvir quietly tries on the pieces of radiation armor he finds in a storeroom in an effort to evade his pursuers. The deception being successful he slips out to the forbidden zone of terminus to find Nyssa. 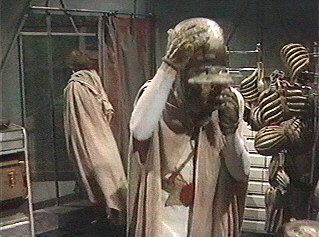 The Doctor in the meanwhile finds Bor as he is trying to wall up the radiation leaking engine. The collecting coalition of Matt and Sarah Parish and purchased the armor as a box lot (item 168) at the May 11th 1991 Bonhams Auction. Remaining in their wonderful collection for ten years, until on the 9th of September 2002 it was boxed up and shipped to me as an extraordinary gesture of friendship and support. It now resides in my Dale City Virginia USA collection.